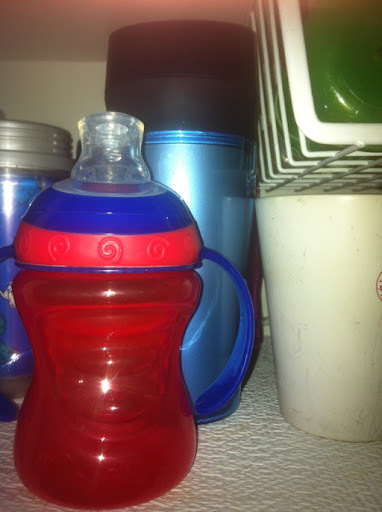 I've had sippy cup issues for almost 4 years now. It started innocently enough. I would forget to put in the rubber regulator once in while that would prevent the sippy cup from drowning our child and letting milk spill all over kid and couch. My problem progressed as we purchased more sippy cups. They had different tops and different threads, and like socks I struggled to find the matching pair and often would result to force fitting whatever top to whatever bottom was readily available. I would strip threads on sippy cups as if they were Ikea furniture. But this morning my wife has solved my issue in one simple step. She put the sippy cup together when putting it away! I can't believe it took this long to figure that one out. Now all I have to do us stumble into the kitchen, grab assembled sippy cup, twist open, pour juice, twist top on, open beer, give kid beer, drink sippy cup. Thanks wife, you are a genius!